Combining a targeted heat focus with the economical use of heating power is key to successfully bending modern automotive windshields. That’s because maximum efficiency in the bending process can only be reached with optimal heating. But what does this mean in practice? Let’s take a look at some recent findings by using expertise from years of experience and applied physics that have been verified in extensive field tests. We’ll start from the basics and look into the ways of transferring heat into the glass. There are three methods of transferring heat: conduction, radiation and convection. Conduction plays no role in mold-based windshield processing. The glass is heated using mainly either radiation or convection, or both. Still, the right combination of these two is essential in optimizing the entire heating and bending process. At the beginning of the heat treatment process, fast and uniform heating is crucial. Therefore, radiation is not suitable here. Radiant heat causes the frits – those black printed areas around the windshield − to overheat, leading to glass defects. And it is very ineffective with coated glass, since the coating reflects much of the radiation away. Convection, by contrast, has a much better heat transfer capability and guarantees fast, uniform initial heating. It heats the glass evenly, regardless of the frits or whether that glass has any conductive or solar control coatings. Other advantages of convection over radiation are better optical quality, higher output due to faster processing, lower energy consumption, as well as space savings, because convection fits easily into shorter furnaces. Convection is a rather new technology in windshield production. However, the active convection heating (ACH) solution has already proven itself as a preferred new technology in the market. It consists of a power-controlled heating system and an intelligent air circulation system in the first heating chambers. This makes the glass heat treatment process maximally efficient. Convective heating works well until transition temperatures are approached. Then, the heat needs to be focused to bend the glass into the desired shape. Here, radiation starts to play a more important role. If you compare the heating system in a modern glass bending furnace with a conventional one, you will notice quite a few differences. In an effective new-generation furnace, the heater system is dimensioned based on the entire heater construction. Furthermore, it is optimized according to the heating power, radiation wavelength, energy consumption and lifetime of the heater itself. New-generation heaters are fitted in parabolic-shaped grooves in the furnace chamber. This innovative design forms an ideal reflecting surface for the radiation, making the heating process much more efficient by enhancing the focus of the heat and minimizing the scatter of the radiation. Another significant difference is in the power requirements. In traditional furnaces, the heaters are installed on a flat surface. Because of this, radiation scatter occurs. Much of the heat is diffused, heating the ambient environment and leading to higher than necessary power requirements. Moreover, to provide sufficient heat on certain areas of the glass, the heater needs to be overdimensioned. This means higher power, an oversized transformer and increased energy consumption. The latest cutting-edge furnaces, with advanced heating systems, direct a net radiation onto the glass surface of about 23−25%. Traditional technology directs only approximately 10−12%. 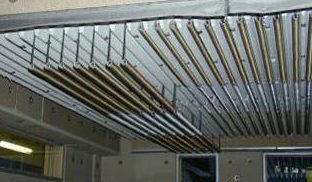 Based on these figures, a flat roof heater construction requires twice the power to achieve the same heating performance as modern, efficient groove heaters. Height adjustment – when does this matter? The net radiation on any glass surface can be intensified by adjusting the height of the heating system. This applies to both traditional and modern solutions. However, the decision of whether or not to leverage this option depends on the wagon height, or more precisely, the distance between the heaters and the glass surface. Extensive tests have been carried out to define the optimal values. The minimum allowable distance between the heaters and glass depends on the amount of power applied. On average, this distance has been identified as 100 mm. If it is less, overheating can cause burn marks or optical defects. 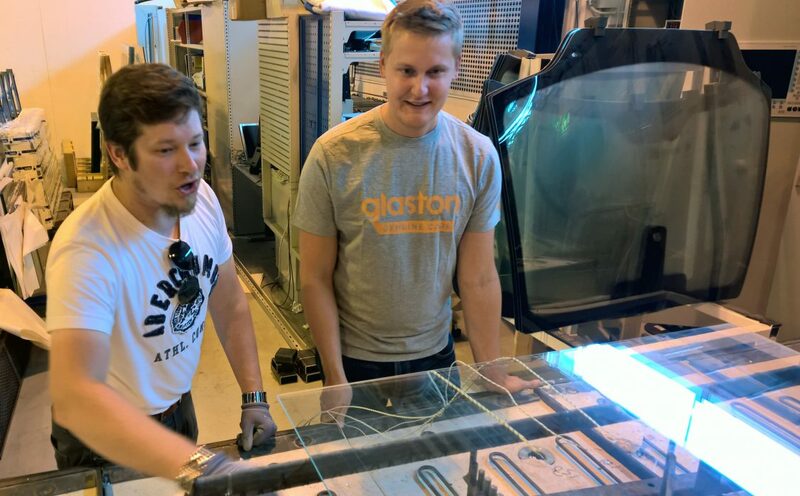 Extensive field tests at Glaston R&D center were carried out to verify the usable options. In a passenger car windshield furnace, the wagon height is typically about 450 mm, and the average distance between the heaters and the glass surface is less than 200 mm. In this case, using any height adjustment does not make sense. In contrast, a bus windshield furnace has clearly higher wagons of about 800 mm. Therefore, height adjustment may bring some added value to the bus windshield bending process. Traditionally, the heat focusing has been achieved by using mold heaters, separate heaters placed below or on the top of the glass. Both systems have its pro’s and con’s. Mold heaters are easy to use, simple and reliable and economical to build. The use of adjustable heaters facilitate the loading and unloading of the glass and mold tuning. Let’s make it simple. There are several ways to improve windshield bending efficiency even in a good old furnace. However, modern solutions enable you to reach higher efficiency faster and cheaper. Technologies have evolved tremendously over the past few years, giving progressive glass processors an edge in production. So they are now enjoying the benefits of more efficient and focused glass heating – saving space, cutting energy costs and increasing profitability.